surrounding area has to offer. Set in the breathtaking Peak District National Park, the Centre is a collaborative venture by Derbyshire Dales District Council and the Peak District National Park Authority. As such it is a hive of information and extremely helpful whether you want to book accommodation or discover the best local hiking routes. The Landscape Detectives exhibition in the Visitor Centre is an interactive display that will give you an excellent understanding of that particular area of the National Park. 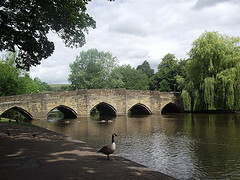 Besides learning about the history of your surroundings, you can also find out what events are going to be going on in and around Bakewell and book tickets. If you’re an active person and fancy a little adventure, the Visitor Centre can provide you with maps of the best places to walk and all the things you can see on the way; such as Arbor Low Stone Circle, the Magpie Mine and Chatsworth House to mention just a few. And if you want to go on a more relaxing journey the Centre will be able to give you up to date information on local rail and bus services. For those of you who want to purchase souvenirs and those all important gifts to take back to family and friends, the Centre has a shop selling a lovely selection of local handmade arts and crafts, so you can take a little piece of the Peak District home with you.